My son Richard and his family were on a visit from Brazil last week. Richard's as keen as I am when it comes to fishing so we had several trips. 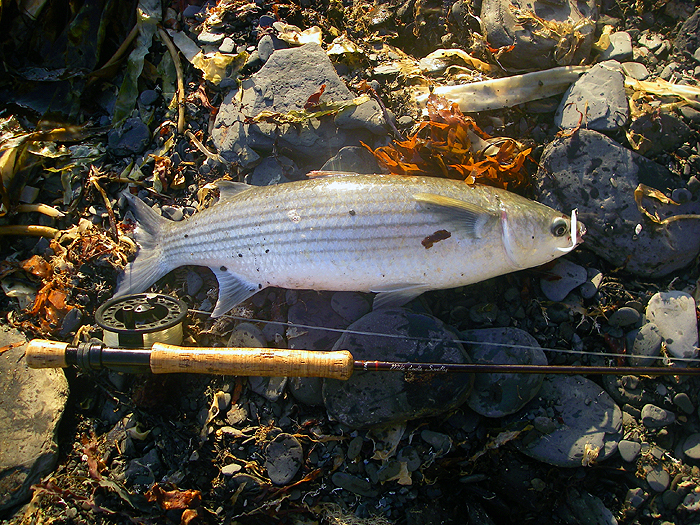 The middle of last week was blessed with a couple of good 'maggot tides' and we'd anticipated decent sport. On the first reasonable tide Richard and I met my friends Bill and Nigel on the shore. At the spot where we fished for most of the time there were a few mullet feeding on the surface but only Nigel had brought his fly gear. 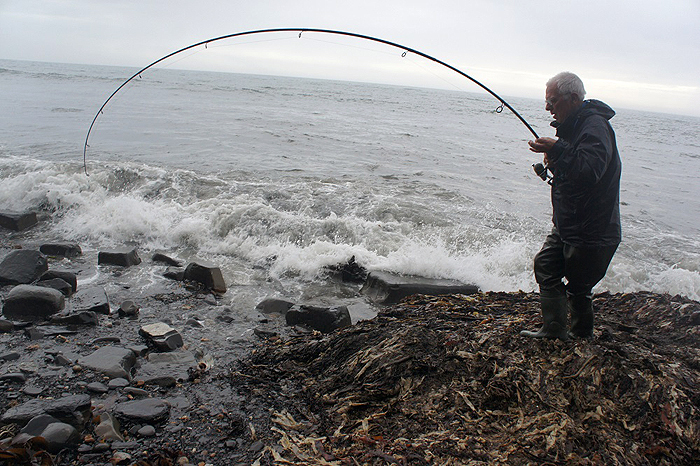 To be honest it was really tricky fishing with a heavy swell crashing onto the rocks and loads of kelp in the edge. If you stood too near the sea the combination of undertow and kelp fronds was likely to drag you off your feet. 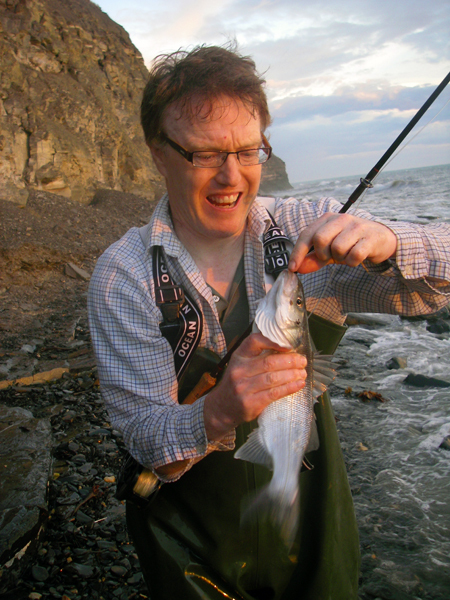 Anyway, we fished, Nigel had a bass on a plug and decent mullet on a baited maggot fly. I had a couple of bass on plastics and Richard caught a small bass using a Delta eel on the fly rod and Bill wandered off on his own and caught a couple of bass by spinning with Sluggills. 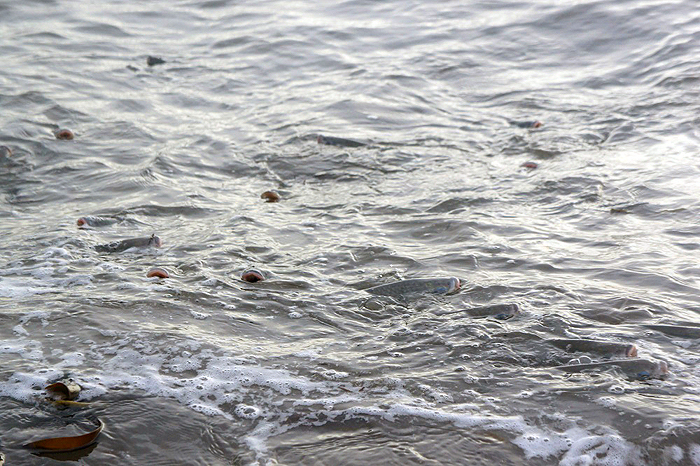 After we returned home Bill emailed to say that there had been lots of mullet feeding on the surface along at the spot where he fished. Of course the temptation was too much to resist so the following evening Richard and I, again joined by Bill, were trudging along the shore in search of mullet. 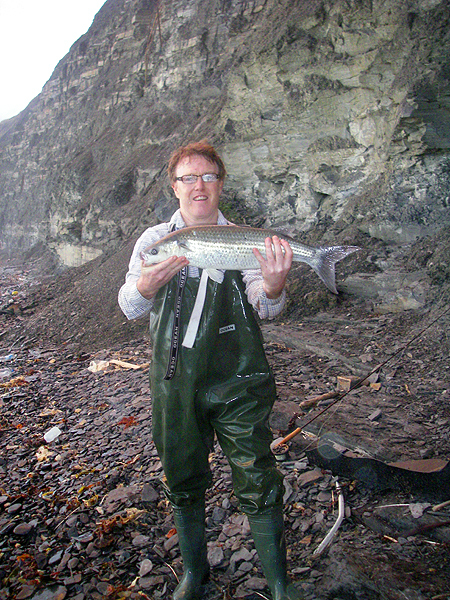 This time we were armed with spinning rods plus my 8wt fly rod, floating line and tiny, white, waggy, plastic eel. Bill's report was spot on. 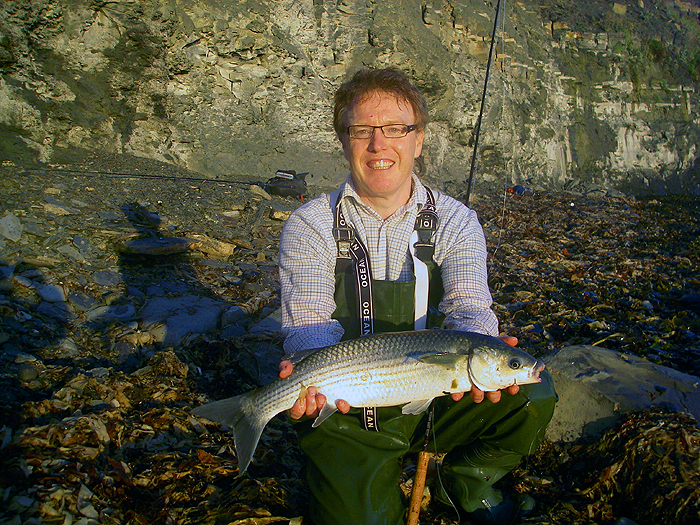 The mullet were again thick on the surface, only just beyond the kelpy margins. It was no easier to fish than the previous evening although there was perhaps a bit less breeze. The others started spinning and I began to cast my little fly. Within minutes I was into a decent mullet. It fought in characteristic fashion and took quite a while to subdue enough for me to slide it ashore on a breaking wave. Six pounds or thereabouts. fantastic! 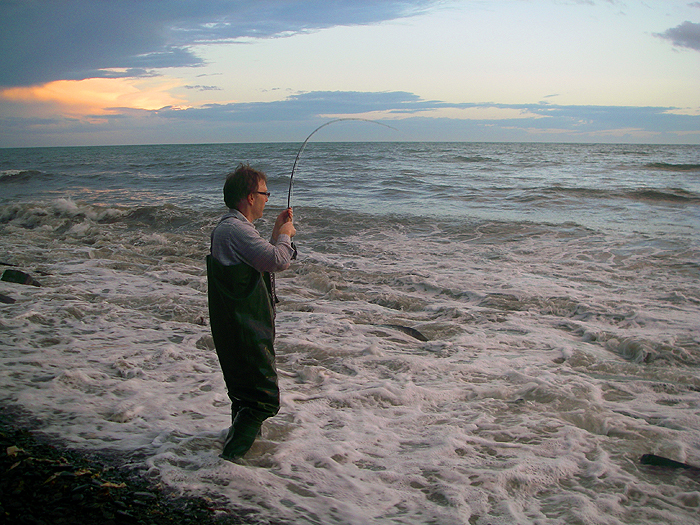 I slipped the fish back and cast again - wallop! once more the rod bowed to a mullet. 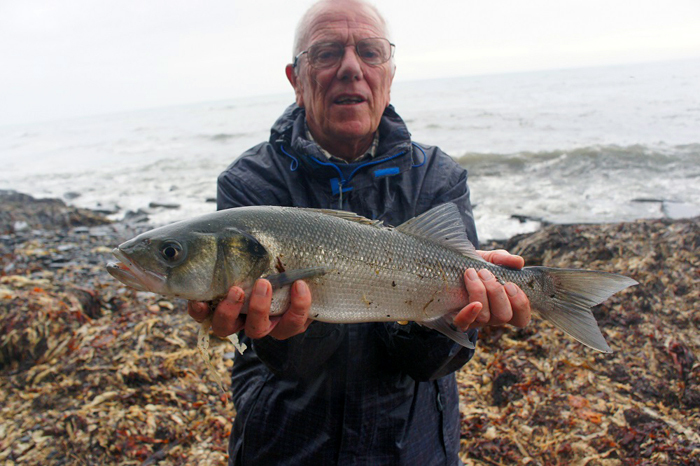 This one was smaller, about two pounds, so it was beached in short order unhooked and returned. At this point I handed the fly rod to Richard and watched him edge his way as close to the feeding fish as he dared. 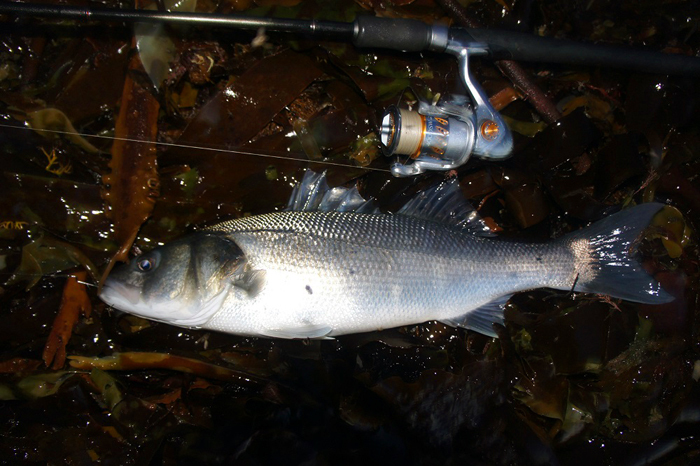 I picked up the spinning rod but before I could cast Richard's rod bowed to a take and he was sliding and staggering about on the boulders as he played another big mullet. I took a few pictures before putting down the camera and helping him to land his fish - six-and-a-half pounds of fat thicklip. Wonderful! He unhooked it and after a couple of pictures back it went. We picked up our respective rods again and blow me down the whole scenario was repeated. Almost before I could start to spin Richard had another fish on. This one was more of a handful and it took ages before he could bring it near enough to be landed. Time after time it surged away as he tried to bring it in on a wave. Eventually it was beached and we stood gaping at it. This one weighed in at well over seven pounds, Richards second PB of the evening. By now, what with playing fish and fighting the undertow, he was shattered and it was getting dark, so we said 'goodbye,' to Bill and set off home. 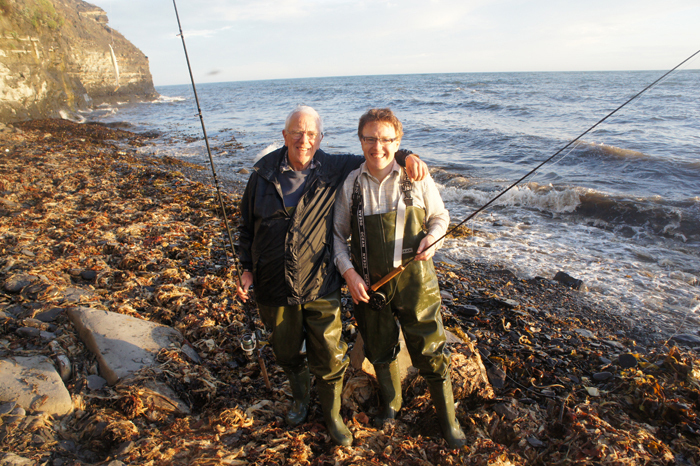 After we left Bill told us that he had a nice bass on the spinning rod so everyone was well pleased with the evening. Bill and I had taken loads of pictures although we don't really need them to remember such superb sport.